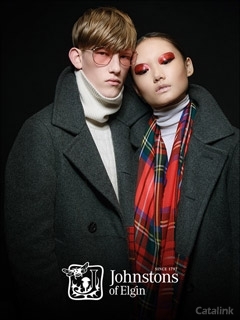 Johnstons of Elgin have been crafting luxurious knitwear, homeware, childrenswear and accessories in Scotland since 1797. Their unique story takes in the couture houses and catwalks of Paris, London and Milan, the sartorial excellence of Savile row and beyond. Johnstons of Elgin always strive to bring comfort and joy to every customer - classic knitwear, essential accessories & luxurious homewares handcrafted for you to treasure. At both their weaving mill in Elgin and knitting mill in Hawick, highly skilled designers and craftspeople work together to create the finest products, using traditional machinery with generations of expertise. There are in the region of 30 different processes involved in transforming raw fibre into luxurious Johnstons of Elgin finished products. Expert craftsmen and women take pride in every thread, every twist, every yarn and every stitch, from raw fibre in the wool store to perfected garment on the showroom floor. From dyeing to blending, carding to spinning, warping to weaving, knitting to teaselling and cutting to folding ‐ it all happens in Johnstons of Elgin's mills in the heart of Scotland. Cashmere is recognised as one of the most prized and precious commodities in the world. They accept only the highest quality fibre, hand-combed from the super soft, downy under-fleece of cashmere goats in Mongolia and China. Johnstons of Elgin has been awarded the royal warrant of appointment as manufacturers of estate tweed to H.R.H. the Prince of Wales, Duke of Rothesay. Subscribe to the Johnstons of Elgin email newsletter and keep up to date with NEW COLLECTIONS, SERVICES & EXCLUSIVE SALE EVENTS. These shoes dont just look great, the most important thing is that they feel fantastic! Pioneering biomechanic technology and super soft fabrics give you the ultimate comfort whatever pair you choose. Sign up to the newsletter to save! Moss Bros have been suiting men for generations. If you love a tailored look made with ease, they have exactly what you need. Sign up to their newsletter today and discover their range of menswear - youre sure to get hooked. By Pressing the Request Newsletter button you give Johnstons of Elgin (and their Data Processors for the specific purpose of delivering your emails) consent to send you their newsletter via email until such time as you choose to unsubscribe.